Today, I was uploading my data from the 2nd Annual Wildwood Warrior Sprint Triathlon on to Training Peaks. I was anxious to see how I performed. Also to give an update to my Coach, so that she can plan my workouts accordingly. 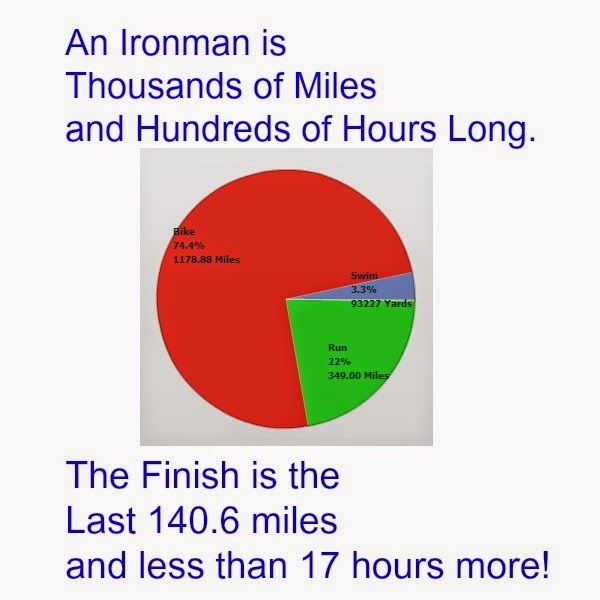 Funny, I've never paid attention to the pie chart, labeled fitness summary on the right hand side of the screen. This time toggled the choices and one was labeled Completed Distance. To my surprise, this year so far I swam 52.97 miles of swimming, biked 1178.88 miles and ran 349 miles! Give or take a few miles! It took me a few minutes to digest what I just saw. Literally hours have been spent in the pursuit of this endeavour. The payoff isn't earning the title of Ironman. The payoff is that others being happier and wanting to excel in their pursuits. If it were not for this journey, I may never have seen my wife look so determined to swim and test her boundaries. I might not have seen my son look so proud coming out of the water first as he heads into transition. I might not have seen the many smiling faces that run by me. I guess I chose this path because I chose to be happy, and this makes me happy knowing I am part of someone else's happiness. My friend John mentioned the word, sacrifice. I that resonated with me and last night I realized what I am doing and others like me are doing and have done is really an Amazingly Awesome Gift that we are giving ourselves and others. Is it really a sacrifice? See those kids swimming, biking and running yesterday was a highlight, and even if I didn't attempt doing an Ironman. So if I happened to stumble upon the kids race by chance. I would have said, "That's inspiring and I want that for my kids!" Give me a few more days to catch up on my Ironman Timberman 70.3 and Wildwood Warrior Sprint Triathlon! Looking forward to going back to work as well!